The Crystal Bridges Museum of American Art in Bentonville, Arkansas features three Norman Rockwell paintings in its collection. One more original Rockwell painting has been as a gift. This Museum contains more than just three fantastic Rockwell paintings, though. The Museum has an extensive collection of art. The most famous Norman Rockwell painting in the Museum's collection is Rosie the Riveter. Read more about Rosie the Riveter. The next most famous Rockwell painting in the collection of the museum is another Saturday Evening Post cover illustration, Sick Puppy from 1923. The third original Norman Rockwell in the museum's collection is Her Hero also known by Horse with Bonnet. 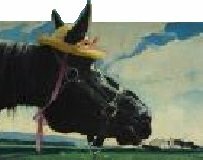 Her Hero (Horse with Bonnet) was originally commissioned by and published in an advertisement for Mobil Oil in 1941. The ad was published in several magazines of the period including the May 26, 1941 issue of Life and the June 14, 1941 issue of The Saturday Evening Post. The original oil on canvas painting measures 19 inches x 39.75 inches. Museum hours are Monday and Thursday 11AM to 6PM, Wednesday and Friday 11AM to 9PM, and Saturday and Sunday 10AM to 6PM. The Museum is closed Tuesday, Thanksgiving and Christmas. Ticket purchase is required to view the exhibits.